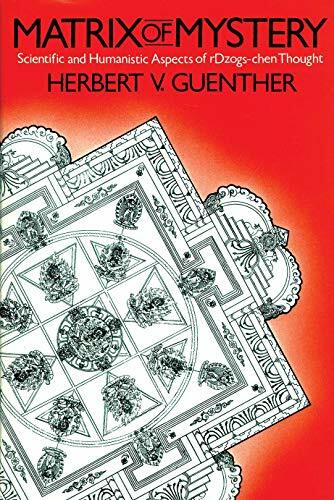 World-renowned Buddhist scholar Herbert V. Guenther here offers the first comprehensive study of the rDzogs-chen or Ati tradition of the Nyingma school of Tibetan Buddhism. <i>Matrix of Mystery </i> explores man's ability to preserve as well as transmit essential insights into the structure of reality. <p></p>Utilizing a key root Buddhist scripture, the <i>Guhyagarbha</i> (&quot;Matrix of Mystery&quot;), along with dozens of commentarial Tibetan textual sources, Guenther presents the most profound teachings of the Buddhist tradition, which represent the culmination of religious thought and practice in Tibet. In relating these teachings in modern scientific and humanistic perspectives, he demonstrates how, in many cases, the traditional religious and modern secular perspectives on the nature of reality interface. <p></p>Professor Guenther discusses the mandala and the deities that reside therein; the organizing principles of body, speech, mind, quality, and action, the three bodies of the buddha (trikaya); the inseparability of prajna and skillful means; and the complex field of Buddhist iconography. Throughout, quotations from numerous Tibetan sources are used to illustrate various teachings. His book will appeal to any serious student of Tibetan Buddhism.